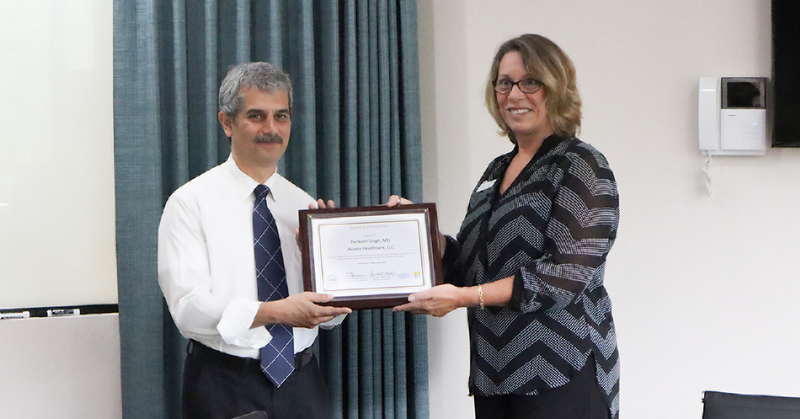 Access Health Care Physicians, LLC, is proud to announce that it has been recognized by Gulf Coast North AHEC (Area Health Education Center) for outstanding efforts to reduce the prevalence of tobacco dependence in the community. The award was presented to Access Health Care Physician’s founder and CEO Pariksith Singh, MD, on May 29 at Access’ main office at 5350 Spring Hill Drive, Spring Hill, Florida 34606. Access Health Care Physicians, LLC, and Dr. Singh were recognized for “Your outstanding efforts to reduce the prevalence of tobacco dependence in our community.” Gulf Coast North AHEC provides a wide range of health education programs, in particular, the “Tools to Quit” program.